Constructive Guidance and Discipline 6 Edition Note: This is the bound book only and does not include access to the Enhanced Pearson eText. To order the Enhanced Pearson eText packaged with a bound book, use ISBN 013338683X. In the Sixth Edition of this highly respected text, the authors provide information about helping children become confident, caring, responsible, and productive people in a strong and thoughtful way. This edition now includes content and examples on infants and toddlers, making the book relevant to teachers of children from birth through age eight. All of the authors’ recommendations about guidance approaches are based on the sound research of Jean Piaget, Alfred Adler and Carl Roger. These insightful recommendations, for novice and seasoned educators alike, further acknowledge the uniqueness of each child, including how individual temperaments and experiences affect behavior. The authors encourage their readers to treat the root cause of behavior problems rather than just the symptoms in order to obtain lasting results. In doing so, they continually present a clear discussion of child development and developmentally appropriate practices as they relate to the causes of children’s behavior. Unique in providing a unified theory base for analyzing guidance and discipline, the text offers a consistent view of external versus internal motivation, explaining why rewards are as damaging as punishment, and why evaluative praise undermines children’s learning as well as their self-confidence. 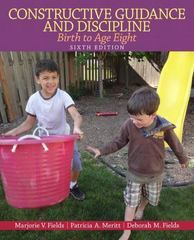 Keenly focused on developmental theory and constructivism, this celebrated resource explains underlying causes for child behavior, weaves numerous infant/toddler, preschool and primary classroom examples throughout, includes two full chapters devoted to challenges stemming from children with special physical or emotional needs, learning disabilities, or risk factors due to poverty, violence, or loss, and many summary boxes and graphic aids to prepare students in becoming experts in guiding young children. The Enhanced Pearson eText features embedded video. Improve mastery and retention with the Enhanced Pearson eText* The Enhanced Pearson eText provides a rich, interactive learning environment designed to improve student mastery of content. The Enhanced Pearson eText is: Engaging. The new interactive, multimedia learning features were developed by the authors and other subject-matter experts to deepen and enrich the learning experience. Convenient. Enjoy instant online access from your computer or download the Pearson eText App to read on or offline on your iPad® and Android® tablet. * Affordable. The Enhanced Pearson eText may be purchased stand-alone or with a loose-leaf version of the text for 40-65% less than a print bound book. * The Enhanced eText features are only available in the Pearson eText format. They are not available in third-party eTexts or downloads. *The Pearson eText App is available on Google Play and in the App Store. It requires Android OS 3.1-4, a 7” or 10” tablet, or iPad iOS 5.0 or later.